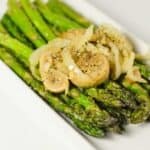 Grilled asparagus – a no fuss and fairly simplistic asparagus recipe that’s grilled to perfection with an optional mushroom and sauteed onion topping. One of the many great things about the summertime is the smoothie and barbecued food that we can indulge. As I sit here on a warm, sunny day, listening to the sound of my neighbour’s lawn mover cut blades of grass. I think about all the food and drink I would like to make throughout the entire summer. In the UK summer is a commodity, the vast majority of the year is cold, wet and rainy, so when the sun comes out to play, that’s when the nation frolics in the warmth. For me I like nothing better than taking out my trusty grill to chargrill a few of my favourite culinary dishes. Today I want to share this simple grilled asparagus dish which I made on the grill. I used my George Foreman appliance but there’s no reason why you can’t use a stove top or regular grill. Asparagus are low in sodium and also low in fat making them incredibly healthy – no need to feel guilty when you’re eating this dish. The top of this vegetable crop resembles a premature flower, with spear shaped tips. Asparagus has many healthy properties, good source of b vitamins which boast the metabolism, zinc and vitamin c which are great for maintaining our immune system and an abundance of minerals potassium, copper, magnesium just to name a few. The asparagus itself has a light, delicate flavour – you don’t have to be over enthusiastic about veggies to warm to the taste. 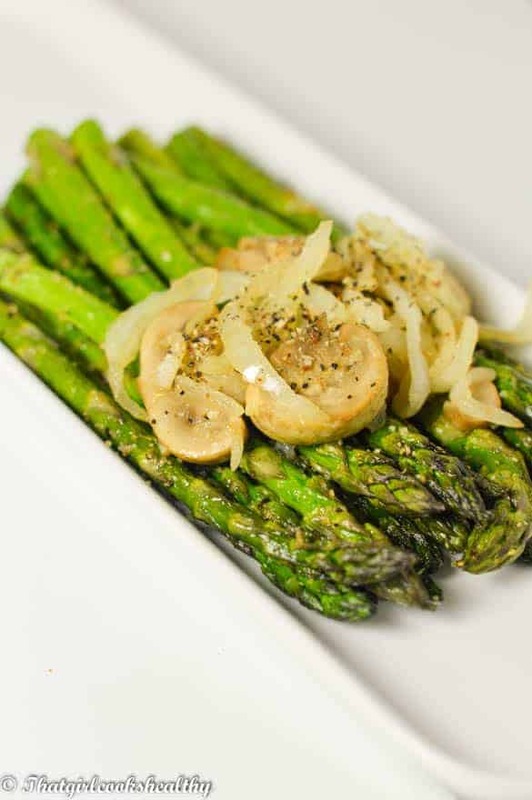 Couple this wonderful vegetable with my garlic enriched dressing – consisting of garlic granules, black, himalayan pink and some olive oil and will trade in a chocolate bar for some grilled asparagus. Mix the garlic granules, black pepper and pink salt with the olive oil – this will serve as the dressing. Transfer the coated vegetables onto the grill and grill for 5-7 minutes. If you’re using a sandwich grill like a George Foreman simply close the lid. Throughout this period turn the spears frequently until a charred appearance is present. Use garlic granules or powder as opposed to fresh garlic to omit burning.